This native muskrat nibbles a plant at the water’s edge. Look for muskrats in Westborough’s ponds, swamps, and rivers, especially near stands of cattails, their favorite food and building material. Westborough’s waters come to life now that the ice has disappeared from all of them except a few vernal pools deep in the woods. Spring is a time to see ducks, frogs, salamanders, tadpoles, turtles, and even insects, but some of the best sights may be those amazing diving animals, the muskrats. Native muskrats (Ondatra zibethicus) are active in our ponds, rivers, streams, and swamps for the breeding season, and the year-old youngsters are wandering in search of territories and mates of their own. 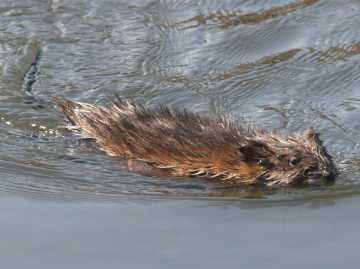 Watch for muskrats swimming in shallow water near shore, looking like logs in motion. People often wonder whether the log-like thing is a muskrat or a beaver. The two might live in the same area, although we have many more areas with muskrats. Size is one key to the answer. Beavers are the really big logs. In contrast, muskrats are modest in size – not much larger than the mallard ducks you might see nearby. It’s hard to judge size when you spot an animal swimming, but muskrats are about a foot long, with a 6-12 inch tail. To see a muskrat covered with thick fur, you might never guess it weighs only 2-4 pounds – about as much as a small supermarket chicken, not even a roaster. Beavers, on the other hand, are much bigger, maybe three times as long (up to 3 feet) and often more than 10 or 20 times as heavy (30-75 pounds). Another key difference is the tail. True to their name, muskrats have a rat-like tail – long and naked-looking. You can often get a look at it when a muskrat dives under the water to escape from your view. Beavers, as we know from cartoons if not from real life, have wide, flat, paddle-like tails. You can see it when a beaver dives and hear it when a beaver smacks the water with it to warn off curious onlookers. A muskrat’s tail is not as rat-like as it might first appear to be. It’s flattened vertically, as if it’s been pressed from both sides. This vertical shape is distinctive and useful in swimming. Muskrats have partly webbed back feet that propel them through the water, but if you watch one swim, you can see the tail at work. It snakes back and forth, helping to keep the muskrat stable and on course. This swimming muskrat makes a V-shaped wave that’s easy to spot from shore. The muskrat looks wet, but its thick fur traps air near its body and keeps the muskrat warm and dry as it dives underwater in all four seasons. A third way to tell whether you’ve spotted a muskrat or a beaver is by the pattern the animal makes in the water as it swims. If it makes a V-shaped wave, it’s a muskrat. The muskrat’s tail contributes to this pattern, pushing water out to the sides. You can even spot a muskrat out in the middle of a pond by recognizing its V-shaped wave. While you watch a muskrat, it’s likely to dive underwater and come up quietly in a different place. A muskrat typically dives for less than 40 seconds, but it can stay underwater for as long as 20 minutes, holding its breath. We don’t usually count our native muskrats with seals, whales, and hippopotamuses, but we should. Like these other diving animals, muskrats are especially well suited for spending long periods underwater without oxygen from air. For one thing, their bodies store more oxygen (in their muscles) than animals that live mainly on land, thanks to their version of a certain chemical. They also have a well developed “dive response” that kicks in when they go under for a while. After a muskrat has been underwater for about 20 seconds, its heart rate slows dramatically, for example, from 320 to 34 beats per minute. Its overall body processes slow as well, reducing its need for oxygen. Many blood vessels constrict, shifting blood to its heart and brain and away from muscles, skin, and less essential organs. Muskrats’ long dives earned them a place in Native American creation stories. In these stories, at a time long ago when there was water everywhere and no land, a muskrat dove down deep to scoop up mud from the bottom. This first ball of mud then became the land, or the earth. 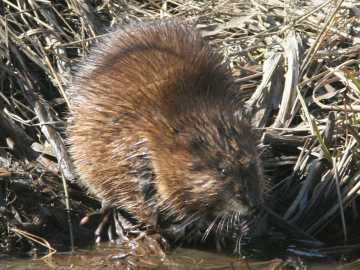 In some versions a muskrat also helped to channel out the first rivers and streams. Sometimes, when you might see a muskrat dive, it doesn’t seem to come up at all. Where did it go? It probably went to hide in its lodge or den, through an underwater entrance. Muskrat lodges can be hard to spot because they look like heaps of plant debris. They’re somewhat cone-shaped and made of mud and vegetation, especially the muskrats’ favorite building material – cattails. You’ll find lodges in shallow water, sticking up a couple of feet above the water. Ducks or geese sometimes nest on top, and snakes or turtles might bask in the sun there. Muskrats also build smaller, lodge-like feeding shelters within underwater-swimming range of the main lodge. Beaver lodges look quite different from muskrat lodges. Beavers build with wood – sticks and mud – and their lodges are bigger, as you might expect for a bigger animal. If there’s a pond- or river-bank nearby, muskrats might dig a den in it. As usual, the entrance is underwater, but the living spaces are above water and dry. Muskrats dig with the claws on their front feet to hollow out spaces inside a den or lodge. A muskrat family shares a lodge over the winter, and it may be family with lots of muskrats – and perhaps a few that aren’t kin. So what do muskrats do when they dive? Mostly they look for food – the underwater rootstocks, tubers, and bases of stems of water plants. They especially like cattails, but they also eat yellow pond lilies, fragrant water lilies, sweet flag, arrowhead, sedges, and more – many of the same plants that various ducks eat. They’re mostly vegetarian, but they’ll also eat frogs, snails, fish, insects, earthworms. When purple loosestrife (Lythrum salicaria) invades a wetland and gradually pushes out the cattails, the muskrats tend to depart, even though they can eat and build with other plants. The invading loosestrife tends to dry out a wet area, making it less suitable for cattails and muskrats. Watch for muskrat pairs as you walk trails along Mill Pond, Lake Chauncy, and the Westborough Reservoir, especially in areas with cattails. You might even see them chasing one another. Look – there’s no need to visit a zoo to see an amazing diving animal.